Thursday March 18th 1926 I went down town in AM. Later to lunch with Ott and Fannie Eavens. Had a letter from Bro Ott with a draft for $10.00 which I deposited when I went back to the Victor. Wrote Mabel McDougall, Sister Ida, and L D L. Came out to Inglewood before supper. Letters from Hattie and Mattie Fletcher. LeGrand is in Boise. Friday March 19th 1926 Wrote Bro Ott before I started down town. Had lunch and went out to Mattie Stitts to stay till Monday. Saturday March 20th 1926 We went out to Major Briggs for dinner. Later took a walk upon the hill. Such a view. When we came back went on down to 1626 1/2 West 7th. I had a letter from Joe Williams. Evening in the room. To bed early. Sunday March 21st 1926 Mattie and I went to The Bible Institute to church. After lunch out to see Lew Price. Called at The Victor on the way back. Evening in the room. Monday March 25th 1926 Mattie came out home with me for lunch. I did some washing for myself. Rested awhile and wrote Hattie. Scott Metcalf home with the folks for supper. Fine day. 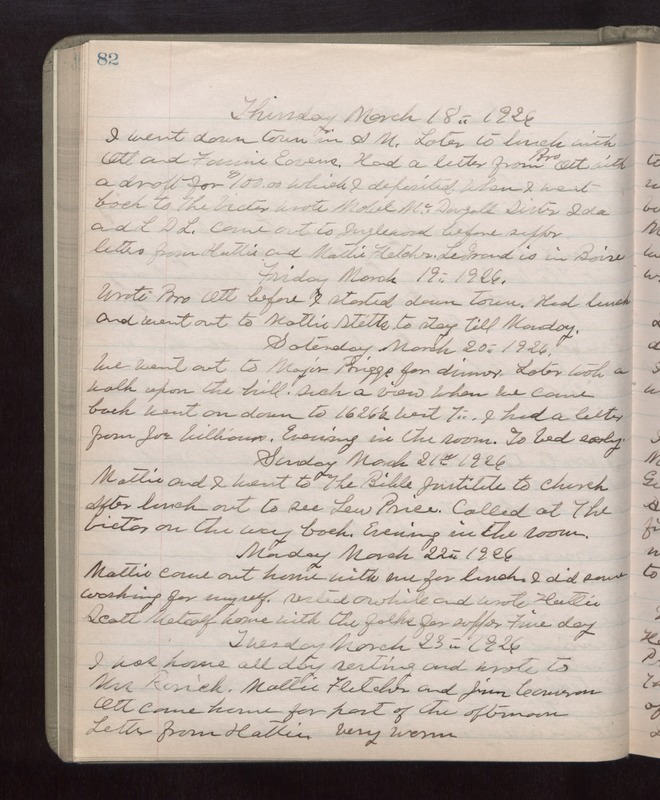 Tuesday March 23rd 1926 I was home all day resting and wrote to Mrs Rorick, Mattie Fletcher and Jim Cameron. Letter from Hattie. Very warm.